My friend Kristin made peach Jell-O in a pan. IN MINNESOTA, WE have hotdish. Not casseroles. We have lutefisk and lefse and food-on-a-stick. And then we have Jell-O. Truly, I thought Jell-O was a thing of the past, even in Minnesota. But Kristin proved me wrong. She brought a pan of gelatin to Family Game Night at Trinity Lutheran Church on Saturday. I’ve seen Jell-O made in bowls—even layered in bowls—and shaped into shapes in molds. I’ve seen Jell-O elevated to a plate of honor during a production of How to Talk Minnesotan at the Plymouth Playhouse. But I’ve never seen gelatin in a glass cake pan. But Kristin, the theatrical type, proved that Minnesotans can get creative with their Jell-O by thinking outside the box inside the box (er, cake pan). 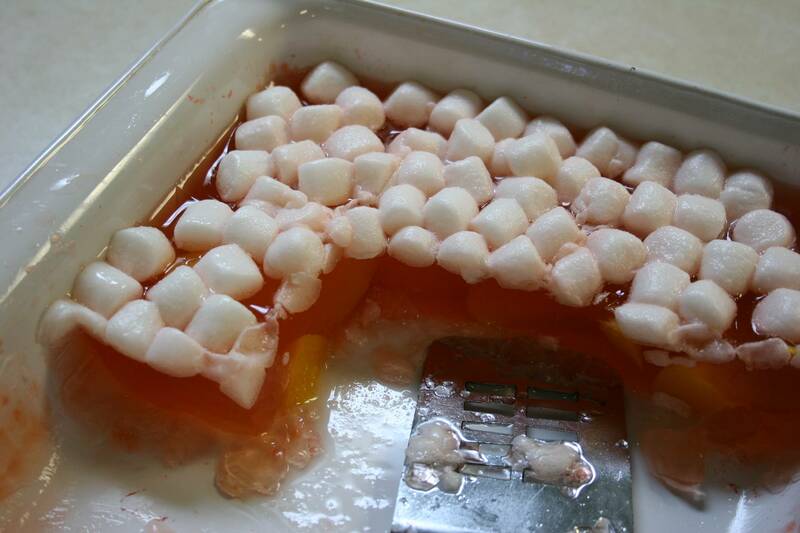 She even stirred peaches into her peach Jell-O and topped it with the ultimate in Jell-O toppings—marshmallows. And then, sin of sins, she cut the thickened concoction into squares. Doesn’t she know that Minnesotans, or maybe it’s just Lutherans, prefer to dish up their Jell-O with a spoon? We are not the show-off type, you know, serving up fancy Jell-O squares. But Kristin, as I suggested, fails to conform to conformity. She sometimes makes cranberry Jell-O and adds cranberries. Did you know Jell-O comes in cranberry flavoring? I didn’t. I thought the flavors were strawberry, strawberry and strawberry. Did you know, too, that you can actually ruin Jell-O? My friend confessed that she once did just that by adding too much water. Oh, Kristin, Kristin, Kristin. Perhaps you should stick with the old standby Minnesota Jell-O recipe: Add sliced bananas to partially-thickened strawberry Jell-O. If you want to get creative, top your bowl full (not pan full) of Jell-O with Cool Whip. But for gosh sakes, Kristin, please serve your potluck Jell-O with a spoon, not some fancy serving utensil. 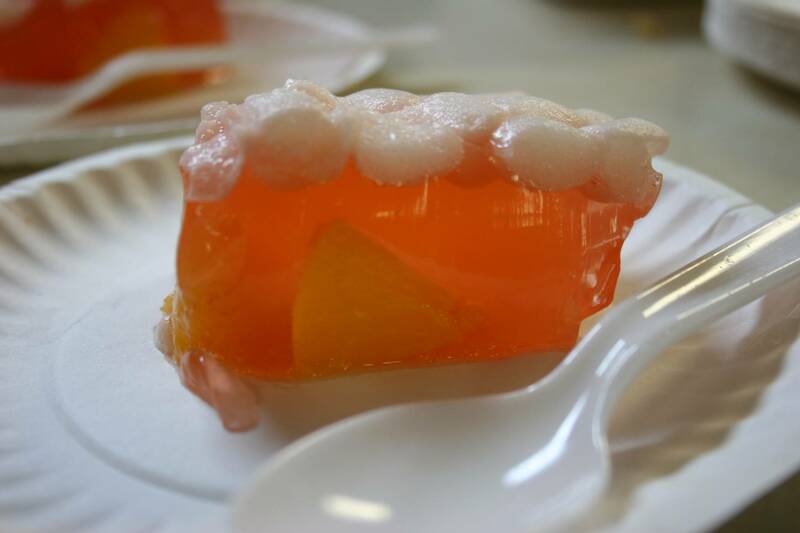 A slice of Kristin's peach Jell-O. DO YOU HAVE ANY interesting stories to share about Jell-O? I’d love to hear yours. So submit a comment to Minnesota Prairie Roots, even if you are a conservative Minnesota Lutheran. Just last night I was to prepare a jello for a funeral and I had my orange jello and mandarin oranges all ready to go and changed my mind. I had jello eggs left from Easter, so I proceeded to cut them up in a bowl and addded Cool Whip to this. Just like that I had a cubed jello salad ready for a funeral. Not a typical “funeral jello”, but I think it will work none-the-less. This is too funny, Dawn. It’s as if I wrote that Jell-O blog post just for you. Funeral Jell-O. I had forgotten about that Minnesota tradition. And here’s something more that you’ll appreciate. My friend Kristin told me that she made Jell-O eggs for Easter too. Perhaps Minnesotans love their Jell-O a lot more than I realize. My fondest memories of Jell-O are all those extended family birthday celebrations when we always, always had banana-laced strawberry Jell-O. Let’s hear some more Jell-O stories. My aunt’s mother-in-law made the best Jell-O salads! It’s not something you’d find at a DC soiree or even in Ohio all that often, but I sure would like some every once in a while. Fruit. Whipped cream. Jell-O in any and every flavor and color you can imagine. Sigh. Wow, you must really love Jell-O. Maybe you’ll have to introduce it to your D.C. circle of friends.